Our network is widely spread all over India screenotex machines are more effective, durable, long term most useful for industries, factories, and all types of shops as it is very useful for printing purpose for Textile printing, Digital printing, Fabric printing, Glass printing, etc. Our various types of Printing machines are Manual Textile Printing Machine, Fabric Textile Printing Machine, Multi Screen Printing Machine, Offset Printing Machine, Flexo Printing Machine, Mug Printing Machine, Textile Printing Heads. We manufacture it using high grade components under the observation of professional experts as per industrial standards . Widely applied by second-hand clothes recycling plants for constricting clothing, comforters, shoes, etc. Hydraulic lifting chamber door improves the work efficiency, opportunity for wrapping and the tight crossed tying.As our machines are cost-effective and productivity is more compared to other machines avail in the market. Textile printing Machine is Mostly used by Textile, Fabric dyeing industry, yarn, Stationary, Plastic, Glass industry, plant, recycling plant etc for different purpose as our Textile Machines are effective, productive at low maintenance cost as compared to other machines in the market.As Gujarat and other cities of India are related with the business of clothes and machinery plant, also where agriculture is there factories related to Textile, Printing, stationery etc growing day by day in villages and cities. So requirement of each customers changes day by day to fulfill their need and market demand we always try to serve our customers with new machinery, plants for business. 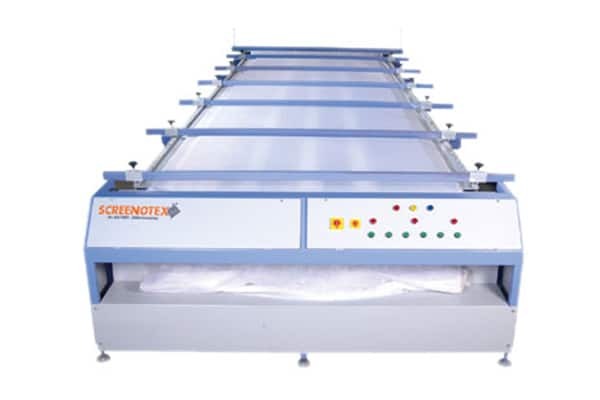 Screenotex Supply Textile Printing Machine to various other cities of India such as Mumbai, Delhi, Punjab, Chennai, Karnataka, Haryana, Madhya Pradesh, Kerala, U.P. Andhra Pradesh etc we also provide our machines in Gujarat state related cities such as Nadiad, Surat, Mehsana, Veraval, Rajkot, Baroda etc as per the requirement of client and order we deliver these machines within given time at required place.